former locals' novel combines zombies with .... the Titanic? As an avid Halloween lover and frequent reader, I can’t imagine a better October release book than a novel about Zombies … on the Titanic. 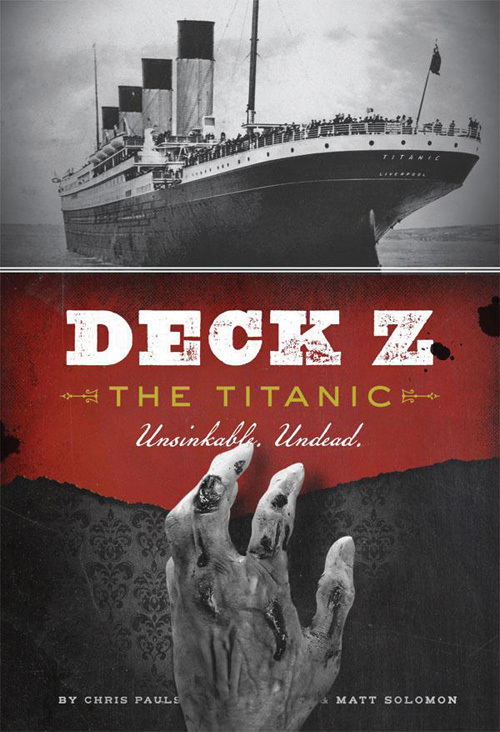 Deck Z: The Titanic is a new book (their first novel) by semi-local authors Chris Pauls and Matt Solomon that chronicles the story of German scientist Theodor Weiss who discovers a strange plague that ravages its victims, transforming them into monsters hungry for flesh. Weiss’s studies show that there may yet be a cure, but when he discovers the military plans to use the disease as a weapon, he procures the only sample and heads for America. He may be safe from the German army, but he finds himself aboard the Titanic. They also wanted to avoid retelling other zombie stories, so they focused their research on the Titanic and built the zombie part of the story in a way that was true to their story. The authors did exhaustive research to make sure they had the layout of the ship and the life on the ship correct. The way that the authors organize the book is into three stages with dates and times marking the beginning of each chapter and is told from a third person perspective. Even if I think it’s pure awesome, some might think it is a bit strange to place zombies in the setting of the Titanic for a novel. When asked ‘why?’ the authors said, “We liked the idea of innocent passengers being trapped with nowhere to run (or swim). It was our way of introducing an Alien-like claustrophobia to the proceedings. Also, the 100th anniversary of the Titanic sinking has the event back in the public consciousness.” The duo worked on the novel for just over a year before being ready for its release. In regards to the publication of the novel, the authors continue with, “We’re excited. We think there’s more here than meets the eye, and that readers will appreciate the story’s detail and ultimately, heart.” You can get this “unsinkable, undead” novel on Amazon, Kindle, and local book stores. Halloween originated centuries ago as a Pagan festival among the Celts of Ireland and Great Britain. Fast-forward a few hundred years to the present day Chippewa Valley where Halloween has become a night when kids stuff their faces with processed sugar and grownups dress up and parade around like idiots. In short, Halloween has become more awesome than ever before. And more than any other time of year, Halloween time is when our thoughts turn to monsters, ghosts, and that ... eerie presence ... lurking just around the corner. The next few pages are a guide to all of it. Rip the pages out and place them beneath your pillow at night – they will protect you.